A couple of nice ladies I know are working on a gathering for Ft. Toulouse’s French & Indian event this weekend and since I haven’t made any real contribution to the effort, I thought perhaps a bit of information might be welcomed. If I can get my own presentation on Native Plants and Animals in the Diet of Colonial Inhabitants of the Southeast ready, I may try to bake up something appropriate to contribute in the way of food. The verdict is out on that possibility as of this morning, however, since I’m not packed yet and the event starts tomorrow. If tea had become such an institution by the time the previous author wrote the statement above in 1839, when would we consider that popularity to have gained momentum? Samuel Pepys wrote in his diary that he had tasted tea for the first time in 1660, although, it was most likely introduced in England some 50 years prior. “I sent for a cup of tee—a China drink—of which I had never drank before”, – 25 Sept., 1660. 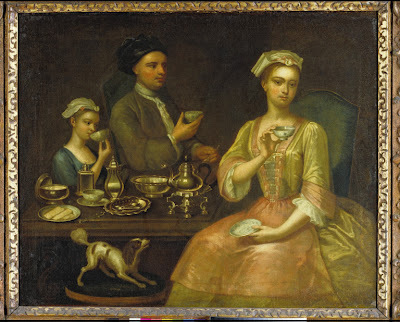 The tea Pepys purchased came from the London merchant, Mr. Thomas Garway, who had received a large shipment three years prior and established a house where he prepared it and sold it to patrons. Pepys did not write of tea being prepared in his own home until 1667. “Home and there find my wife making of tea, a drink which Mr. Pelling, the potticary, tells her is good for her cold and defluxions”. Garway had a handbill circulated which told interested parties he was a tobacconist and seller and retailer of tea and coffee located in Exchange Alley, “near the Royal Exchange in London”. 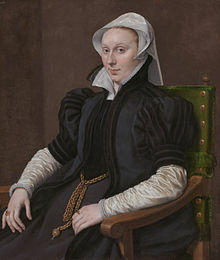 Interestingly enough, my direct ancestor, Sir Thomas Gresham, is credited with the creation of the Royal Exchange some years before, Sir Thomas, having died in 1579. One would assume from Pepys’ diary entries about the introduction of tea, that Sir Thomas may have died blissfully unaware of the beverage or the pomp and circumstance associated with drinking it in the early days of its use. 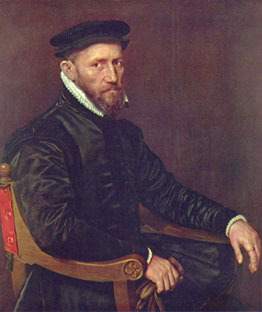 The author’s ancestor, Sir Thomas Gresham of London. Another source claims, however, that the East India Company brought tea to England in the first half of 1571. If that is true, then Sir Thomas and his illustrious brothers would have almost certainly joined their wealthy counterparts at the tea-house or tea-gardens of London. In 1710, a tea house was founded which is probably familiar to most Americans – Twinings. A portrait of the founder, Thomas Twinings, painted by Hogarth, remained a fixture long after he was gone and the establishment was being run by his great-great grandsons. Montgomery Martin wrote that in 1662 Charles II married Princess Catherine of Portugal who was exceedingly fond of tea, and credited her with helping to make tea-drinking fashionable in England. Others, such as Dr. Alexander Carlyle, through their writings added to the appeal of tea-drinking among the wealthier class. “The ladies gave afternoon’s tea and coffee in their turn, which coming but once in four or six weeks amounted to a trifle”. The gentry found a vast array of treats to partake of while enjoying their cup of tea, including fruit tarts, rich cakes, gingerbread, fruits in season, dry sweet-meats, and cheesecakes, but what of the country people? A historian for the town of Whitby wrote that, “tea was very little used a century ago, most of the old men being much against it, but after the death of the old people it soon came into general use”. 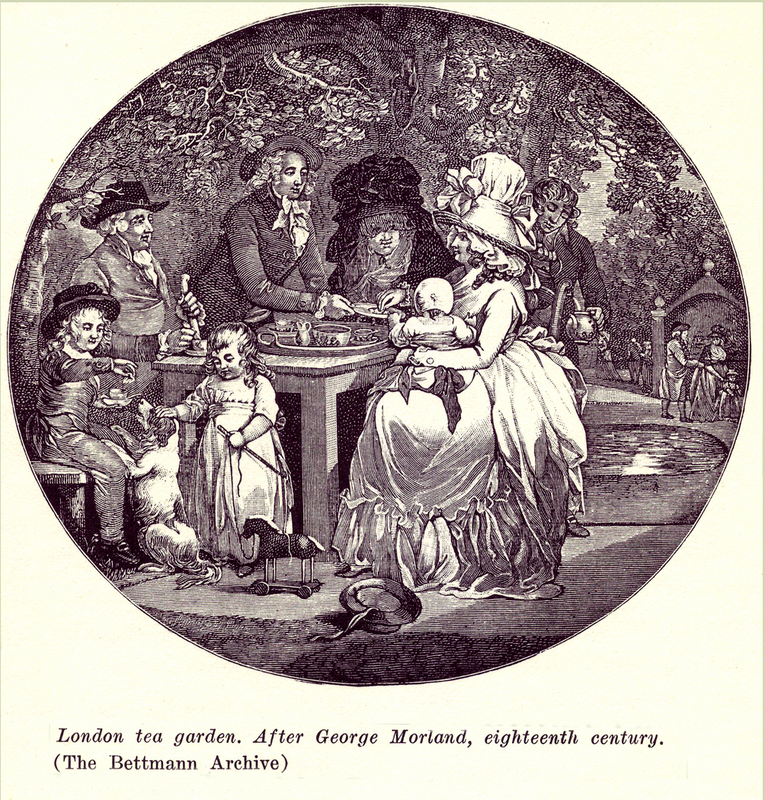 The frequent loss of teeth in America was set down to the account of tea, when it had hardly been in general use for one generation. 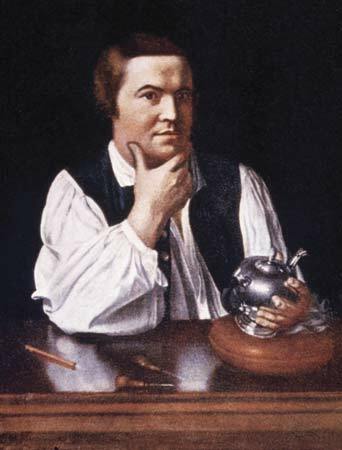 A colonial historian of New York in 1756 said, “Our people are shamefully gone into tea-drinking”, and an Annapolis broadside of 1774 calls it “that detestable weed, tea.” In 1742 Benjamin Lay, the Quaker Elijah, went into the market-place in Philadelphia at noon-time, during a general meeting of the Society of Friends, and “bore a testimony” against tea-drinking by mounting a huckster’s stall and breaking piece by piece with a hammer a valuable lot of china-ware that had belonged to his deceased wife. In vain the crowd sought to stay his hand by offering to buy the dainty cups and saucers; the people at last pushed the enthusiast down and carried off what was left of the china. 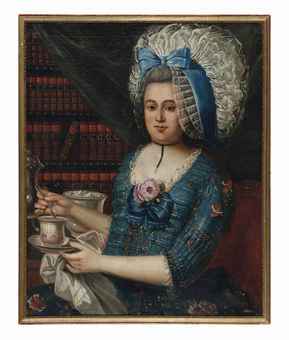 The great popularity of tea-drinking was probably due in part to the wide-spread notion that it was a novel and rather dangerous dissipation. But all the effects supposed to come from tea-drinking were not bad, for the Abbe Robin, who says that the Americans took tea at least twice a day, attributes to this beverage the ability of the Revolutionary soldiers to endure the military punishment of flogging. Source: The Century Illustrated Magazine. Vol. 29. April 1885. Wafers are thin crisp cookies, plain sweetened versions, or flavored with a variety of ingredients, baked in the manner of waffles. They could be served flat or they could be wrapped on a round object as soon as they came from the oven which resulted in a rolled product. The eminent diarist, Samuel Pepys, was among the 17th century writers who made mention of eating wafers. – Pepys, Samuel. Diary. 1661. London. Another dictionary from that time period spelled oublies obleè or obliè, again, called such by the French. As will be seen in the following quote, the French have a long history of making and serving wafers. – Cowel, Dr. A Law Dictionary: Or the Interpreter of Words and Terms, Used Either in the Common or Statute Laws of that Part of Great Britain, call’d England. 1708. London. There is a plaintive cry that rises from Paris streets about sundown, accompanied with the monotonous sound of a wooden rattle, that is delightful to the ear of French children, and has been a familiar sound, through life, to the oldest inhabitant of Paris. The street-seller of ‘plaisirs’ or oublies as they are called long, long years ago, is generally an elderly woman of somewhat lively temperament, dressed with scrupulous neatness, her head covered with a cap, white as mountain snow. She must needs be amiable, and of a kindly habit of mind, for it is her business to please, and attract children to that magic round green box, in which she holds those frail crisp cakes, curled in the shape of sugar-bags, which have delighted—well, how many generations shall we say? —of the vivacious, light-witted children of Lutetia. These oublies of sweet paste, cooked between hot irons, have come direct down, according to some authorities, transmitted to the Paris bèbès of to-day, from the Obliophores, who used to cry their cakes, or obolios, about the streets of ancient Athens. Certain it is, however, that the rising generations of Parisians have been delighted with the toothsome oublie or plaisir from a very remote period. Time was, when the King of France had his Officer of the Mouth, whose duty it was to offer oublies to the royal guests. Centuries ago the street vendors of oublies (which were carried about hot, in a basket laid out with white linen) tempted their customers to gamble with dice for their dainties. Sometimes a very lucky gambler would win the basket and its entire load. Levasseur, in his history of the working classes, describes how the students, when they had won a whole basket of oublies, were in the habit of hanging them outside their windows in triumph. But when the makers of oublies, or oublayers, were formed into a corporation under regular statutes, the use of dice was prohibited, and the oublayers gradually developed into a great corporation [guild] of pastrycooks, making infinite varieties of pastry. Considerable skill was demanded from the journeyman pastrycook, even in the thirteenth century, for then he was compelled, by the statutes of his corporation to prove that he could make at least a thousand of the cakes called ‘heules’ in a day…and time was when vassals were compelled, on certain days of the year to offer oublies to their feudal lords; so that the oublayer occupied a somewhat important position. – Jerrold, Blanchard. At Home in Paris: and a Trip Through the Vineyards of Spain. 1864. London. 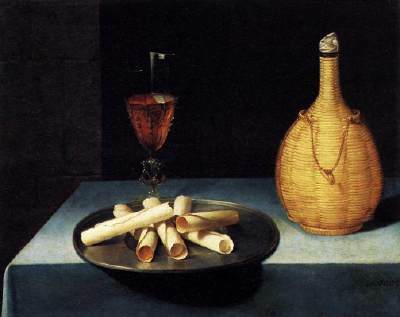 Wafers were among the items meant for guests as a last course in their meal in the 1390’s. The notation, “Hippocras and wafers to finish”, was listed following the dessert course. – Greco, Gina & Rose, Christine, translation. Le Menagier de Paris. 2009. Cornell University. In 1826, an article on food made the comparison between the sweet wafer and the item by the same name used in communion. The similarity lay in the appearance and not the flavor of the two items. The Wafer, by far the greatest favourite of the French, and common over Europe, was probably Grecian or Roman origin and was early known in the middle ages by the name oblatae, the term given to the holy cakes used in the Eucharist. Hence the French oublie, which in that language, as well as wafer in our own, denotes both the consecrated and the common cake. In form it was round and thin, and baked, as the Eucharistal one, between two flat hot irons, shutting together by a pivot, and ornamented inside, so as to leave the impression on the cake. – The Gentleman’s Magazine, and Historical Chronicle. “The Cries of Paris in the Thirteenth Century”. Vol. 96, Part 2. November, 1826. Wafers also referred to wax disks used to seal letters, but for this article we will concern ourselves only with the definition of a, “thin round cake, often formed into a roll, sold by pastry cooks; this seems to be the Earliest use of the name in England, and the persons selling them were formerly called waferers”. – Ripley, George. The New American Cyclopaedia: A Popular Dictionary of General Knowledge. 1863. NY. They were baked on wafer irons which opened and closed scissor-fashion, with two flat round surfaces on the end. They were made of iron and are fairly heavy to handle in making any significant quantity of wafers. The flat surfaces were inscribed with a design of some sort which pressed the decorative design into the wafers. To bake the wafers the cook was to, “Heat an iron on both sides over a moderate fire. Rub it inside with a little butter, put a tea-spoonful of the wafer batter into it, close the iron upon this almost immediately, and put it on the fire. When cooked upon one side, turn it upon the other. Cut away the superfluous paste round the edges, and roll the wafer on a stick while it is still warm. Put in another piece of batter and repeat until all the batter is used. Keep the wafers in a tin box in a dry place till wanted. They are generally served with the sweets”. – Cassell, Ltd. Cassell’s Dictionary of Cookery. 1883. NY. Do not expect that there was any consistency in the receipts as to the thickness of the batter as it varied from a thick batter poured onto the heated surface of the iron by a spoon to pinching or cutting off small pieces and laying them onto the iron. Even receipts within the same book varied a great deal in the thickness of the batter or dough. Flavoring agents used in 18th century receipts included chopped almonds or pistachios, mace, nutmeg, cinnamon, orange zest, orange-flower water, rose-water, and lemon, etc., later, the 19th century saw a variety of spices and flavorings added to the repertoire such as ginger, vanilla, and cardamom. At the turn of the 20th century, the rolled wafers were often filled with whipped cream. Cafes in Paris served flat wafers imprinted with the name of the café along with various ices. – By an American. Ice-Cream and Cakes. 1909. NY. Let’s compare receipts, for a pourable batter, and for making balls of paste to be placed in the irons. In so doing, we may also compare receipts from the 16th century through the 19th. Gervase Markham’s receipt for wafers was surprisingly easy to follow considering the early date of publication. To make the best Wafers, take the finest wheat-flower you can get, and mix it with Cream, the yelks of Eggs, Rose-water, Sugar, and Cinamon, till it be a little thicker than Pancake-batter, and then warming your Wafer Irons on a charcoal-fire, anoint them first with sweet Butter, and then lay on your batter, and press it, and bake it white or brown at your pleasure. – Markham, Gervase. A Way to Get Wealth. 1668. London. 2. Markham, Gervase. The English Huswife. 1615, Michael Best edition. 1986. McGill-Queens University Press. Kingston and Montreal. By, “anoint them first with sweet Butter”, he means to grease the heated irons with butter to prevent the wafers from sticking. John Nott’s cookery book  contained five receipts for wafers, a good indication of their popularity. Two versions were made primarily of flour and cream, another was made with, “the yolks of 4 Eggs, and three Spoonfuls of Rose-water, to a Quart of Flour; mingle them well, make them into a Batter with Cream and double refin’d Sugar, pour it on very thin, and bake it on Irons”. – Nott, John. The Cooks and Confectioners Dictionary. 1723. London. Nott’s second receipt was quite lengthy, requiring the flour and cream to be mixed and left to sit overnight before mixing in sugar and orange-flower water to the consistency of milk. A spoonful and a half of the mixture was poured onto the heated iron to bake. He advised rubbing both sides of the wafer iron with butter periodically to prevent the wafers from sticking. The cook was to, “open your iron a little, and observe, if it come to a good Colour, it is enough”. When done, the wafer was removed with a knife and rolled, “round the same” where it was allowed to cool. Once cooled, the sugar hardens and the wafers retain the rolled shape. Take two Spoonfuls of Cream, two of Sugar, the same of Flour, and one Spoonful of Orange Flower Water, beat them well together for half an hour, then make your wafer tongs hot, and pour a little of your batter in to cover your Irons, bake them on a Stove Fire, as they are baked roll them round a Stick like a Spiggard, as soon as they are cold, they will be very crisp; they are proper for Tea, or to put on a Salver to eat with Jellies. – Raffald, Elizabeth. The Experienced English Housekeeper. 1769. Manchester. Wafers, Dutch. Put seven ounces of flour upon a pasteboard, and work it to a smooth stiff paste with three ounces of butter, the grated rind of an orange, five ounces of powdered sugar, and one egg. Divide the paste into pieces the size of a pigeon’s egg, form these to an oval shape, and bake in an oval wafer-iron. – Cassell, Ltd. Cassell’s Dictionary of Cookery. 1883. NY. 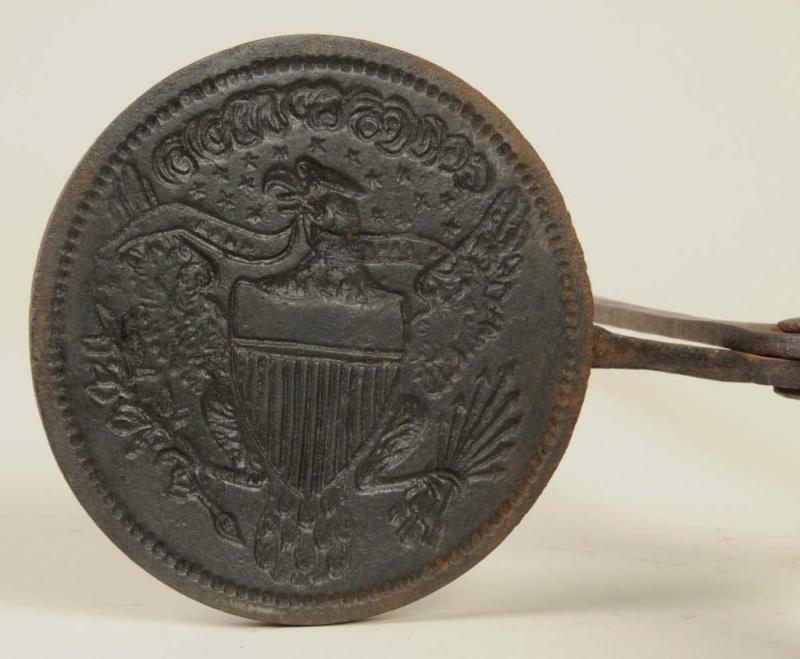 Imprint on the inside of the plate of an 18th century wafer iron. The wafer bears the imprint of whatever design is carved into the plates. At various time periods through the 18th and 19th centuries, receipts are found which instruct the building of a confection on top of a wafer, in essence, the wafer forms the base or foundation. Such wafers can be purchased from the King Arthur flour catalog and the description reads that they are designed to cradle certain German cookies. Modern redaction: 4 Tablespoons unsalted butter, 2 eggs, ½ cup sugar, 1 teaspoon vanilla, 1 teaspoon orange-flower water, ½ teaspoon cardamom seeds, grated zest of 2 oranges, 2 cups unbleached flour, butter or piece of pork fat for oiling the iron. Melt the butter and set aside. Break the eggs into a bowl, and whisk in the sugar until well blended. Whisk in the melted butter, being careful it has cooled enough not to cook the eggs. When this mixture has cooled, add the vanilla, orange-flower water, cardamom seeds and orange zest. Stir in the flour until the mixture is smooth, but do not overwork the dough. Let the dough rest for 20 to 30 minutes. Turn onto a floured surface, dust with flour, and form into a long roll about the diameter of a small egg. Cut this dough into about 18 pieces of equal size. Roll the pieces of dough into balls. Cover to prevent drying while baking. Place a tripod over coals that have been pulled out of the fire onto the hearth. Place the wafer iron on the tripod and rotate it to heat both sides of the iron. When ready to bake, grease both plates of the wafer iron, then place a ball of dough onto the center of the wafer plate. Close the iron. Bake until the wafer begins to brown, rotating the iron as needed. Usually one to two minutes is sufficient time. Remove the wafer from the iron and place onto a rack to cool. OR, if desired, roll the wafer onto a round form and allow it to cool. Add more coals underneath the tripod as needed in order to maintain an ideal baking temperature. Note: Wafer irons changed little in design over two or three centuries, other than perhaps the degree of skill and the subject matter of the design imprinted on the plates. Those in the collections of museums in the U.S. and Europe dated to the 17th century or earlier are no different from the ones in my collection which I estimate to be early to mid 18th century. Irons from the 17th century and earlier often depict Biblical images or images associated with heraldry, whereas flowers and leaves, geometric patterns, or patriotic images were common later on. For those who have an interest in serving wafers, but either don’t want to bake them or don’t have a wafer iron to bake them on, see www.stashtea.com, and type in “wafers” in the search box. They offer wafers, “faithfully baked following a 200 year old European recipe”. As a child, I enjoyed gathering eggs with my grandmother and seeing whether or not the hens had left eggs for us to find. There is no comparison to well-kept farmyard eggs and mass-produced store-bought. I loved having the banty eggs fried up for my breakfast – their dimunitive size seemed tailor-made for someone my size. I liked comparing them to the giant eggs the turkeys laid and I’ve made bite-sized pickled eggs out of fresh quail eggs. It’s difficult to find fresh farm eggs now, and I often wish I had a larger place where I could gather my own. The following demonstrates the care that should be taken in keeping laying hens and gathering their eggs for personal use or for sale. It is good sound advice even today. While there are a few egg producers who take the best of care of their product, the average farmer considers the eggs produced on the farm a by-product and makes very little provision for their care, aside from gathering them. A large loss is caused by dirty eggs, the number being enormous, and according to the estimate of Secretary Wilson of the Department of Agriculture this money loss to the farmers in the United States amounts to about $5,000,000 annually. This loss is very largely brought about by not gathering the eggs often enough. In wet weather more dirty eggs are found than at any other time. This is caused by the fact that the hen’s feet are often covered with mud or other filth, and in going on the nest to lay she soils the eggs already in the nest. An insufficient number of nests is often the cause of many of the dirty eggs found. 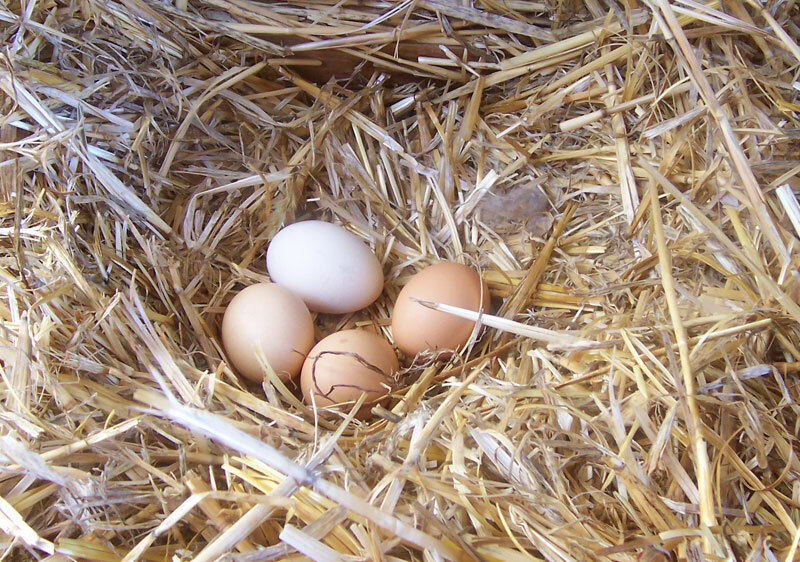 Eggs are laid on the ground and around the hay and straw stacks, and becoming stained, are classed as ‘dirties’. Again, when too many eggs are allowed to remain in a nest some are broken and many of the others become smeared with broken yolks. This condition is often brought about by allowing the broody hens to use the same nests with the layers. On a farm where one nest to every four hens is provided and the nests are kept clean and well bedded, it is found that very few dirty eggs are produced. After gathering the eggs, care should be taken not to put them where they will become heated, or near oil, onions, or other vegetables as they readily absorb odors. Although dirty eggs may be perfectly fresh, they invariably sell as ‘seconds’, and when but a few dirty eggs are mixed with an otherwise fresh, clean lot, they materially decrease the price of the clean eggs. – Southern Planter. Jan. 1912.